The premise was simple: Take a picture of yourself in some reflective surface. That’s it. It seems so very straightforward in today’s age of ubiquitous photography and instant updates but there was a thoughtfulness that went into every picture posted. Keep hitting the “surprise me” link to see what I mean. 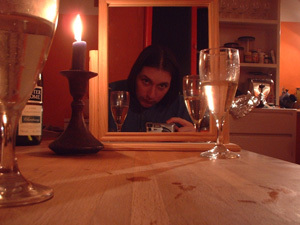 My first Mirror Project shot was taken eleven years ago. I have a few more in there. I used to blog about The Mirror Project every time one of my pictures was posted. 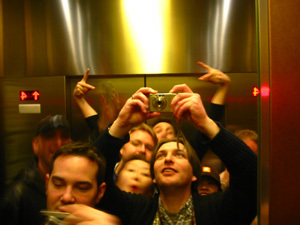 I even used to have a little widget on this site to show a random Mirror Project shot. Here’s a shot that Jeffrey took at the start of the millennium. That picture went on to have a life of its own as a book cover. It even spawned a meme. 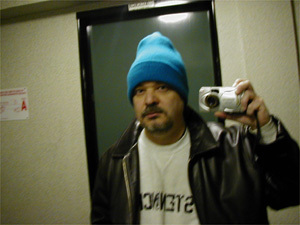 Back then, I never could’ve imagined in my wildest dreams that I would get to know Jeffrey Zeldman, much less call him my friend. Here I am, eleven years later, writing and speaking about web design with my hero from way back when. Crazy! Within a year, the Mirror Project reached its 10000th picture (just look at those fresh-faced kids). 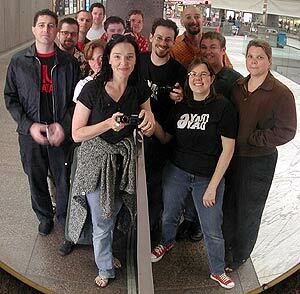 My last Mirror Project shot was taken at South by Southwest in 2005. My first pictures on Flickr date from the same time—when the worst-kept secret at that South by Southwest was that Flickr was being bought by Yahoo. Online digital photography was changing. The Mirror Project has been gone for six years. It warms my heart to see it return, its URLs restored, its images reflecting back.